Appreciation: I'll say 8.5/10 because I think Wong Lung Hang is nicer. 10/10. Some parts of the climbs can't bypassed and are not recommended if you are afraid of heights or out of shape. Cel phone coverage: Rare coverage on stream. Somecoverage on trail coming back. Get to the Diamond Hill MTR station. 's bus terminus, or Choi Hung MTR exit C2. Bus 92 will get you to Sai Kung any day. It is about 1/3 the price of 96R but it is slightly longer (50 minutes instead of 35). On Sundays and holidays, you have the option of taking 96R. Check the PTES schedule for details (http://hketransport.gov.hk). At the end of the beach, there's a stream and a bridge crosses it at a distance. Walk towards the bridge and go past it on the left-hand side. Go through the bushes and you'll see a clearing with mesh fences forming some sort of a pen. Go around it on the right, keep walking parallel to the stream. Eventually, the view will open up to the stream and the mountain. (1) You will first go by a punch of deep pools. Pass on the left. When it is hot, these are packed with people. (2) Refered to as "the wall", Thousand Silk Falls (千絲瀑). Looks harder than it really is. Climb on the right. (3) Ming Yau Falls (鳴幽瀑), 30ft tall. Path to bypass is on the right. We're bypassing the falls, ending up on top. 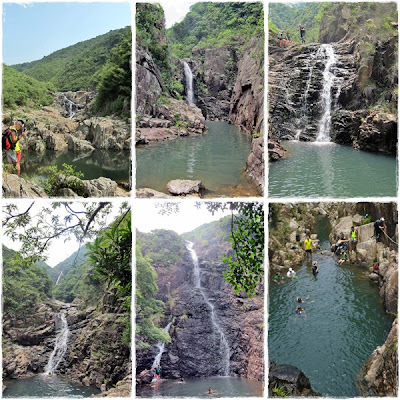 (4) The 100ft tall Chong Yau Falls (藏幽瀑). Climb on the left. Not very difficult but it is definitely more work than your regular hiking. 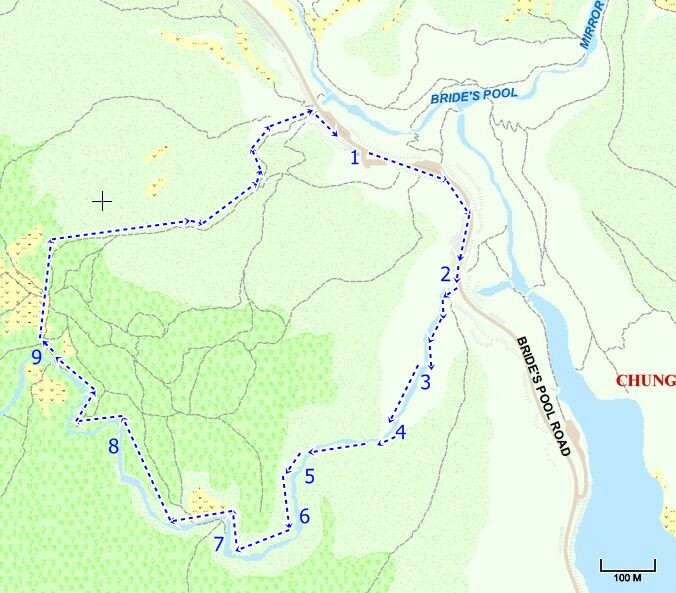 (5) You'll arrive to this gorge with no option but to boulder your way through on the left-hand side. It is a bit tricky. Black Deer Pool Falls, 45 feet tall. Bypass on the right. (6) Reindeer Pool (順鹿潭). Climb on the left. Be careful, tricky climb as well. (7) 60ft-tall Well Bottom Pool(井底潭) Falls which should be bypassed on the right-hand side. (8) Ben Cho Falls (奔槽瀑). Climb on the left. 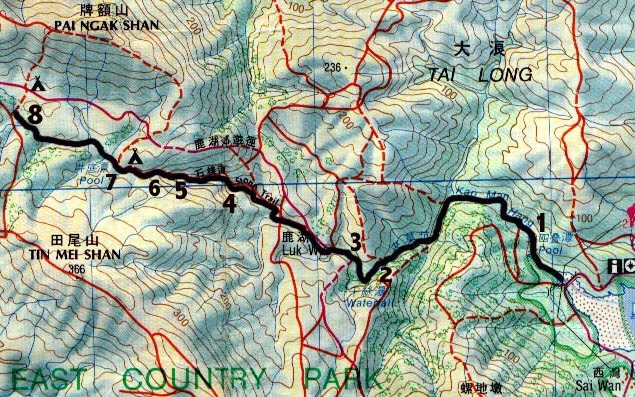 You will reach the main trail. Head left. 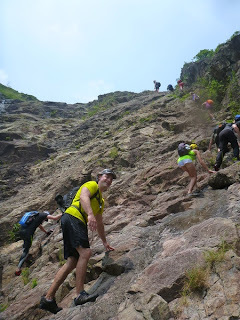 Continue all the way to Pak Tam road where you can catch the bus back to Sai Kung. A mostly downhill 3k. 6/10. Not very hard. Still stream trekking though so it is more challenging than regular hiking. Please, do not attempt to climb directly in the larger falls. People did lose there lives there. Instead, follow the ribbons to bypass the larger falls. Cel phone coverage: Rare coverage on stream. Full coverage on trail coming back. Appreciation: 9/10 lower part of the stream, 7/10 higher part; the big falls are in the first half. Need to go once it has rained a lot to get decent water flow however. Transportation: Go on Sundays, you'll have the luxury of taking KMB bus 275R from the Tai Po MTR station which will drop you off very close to the stream entrance (otherwise, you'll have to walk an extra hour to the stream). Same way return. Note that the last bus is at 18:45 so don't be too late. Take the East Rail MTR to Tai Po. Exit A3, tunnel, then follow directions leading you to bus stop 275R (it is behind the pillar although the schedule is in front of the pillar). (1) No choice but to get out as your stop is the terminus station. Follow the road back towards where your bus came from. Quite a short walk actually; about 8 minutes to the bridge where you will see the stream on your right. You will walk along the stream for a few meters then enter the stream proper. (3) 15 minutes into the stream, you'll see this first medium size fall. Bypass it on the left . (4) DragonBall Waterfall(龍珠瀑). 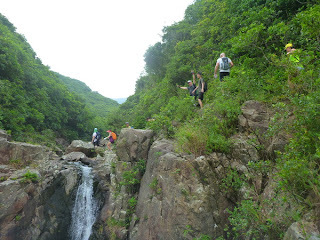 One of the most spectacular waterfall I have seen in Hong Kong, after good amount of rain. Clear bypass on the left, marked with ribbons. Don't try to climb the waterfall. The bypass. Going back to the top of the waterfall. (5) About 20 minutes after the waterfall, you'll reach this dam. Pass to the left, there's a path to avoid the subsequent pool. (6) Another 20 minutes and you'll reach this large pool. Although the climb looks easy enough, if you want to do so, you'll have to swim there. Otherwise, bypass it following ribbons. 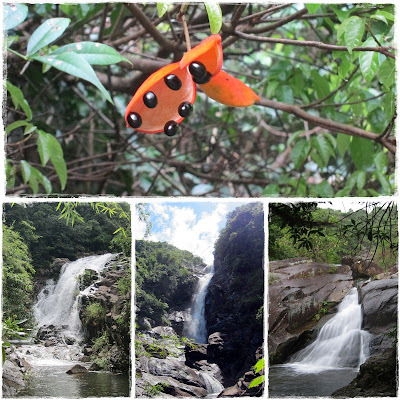 (7) 15 minutes after, you'll get to the other major falls. Quite pretty when there's good waterflow. Bypass on the right . (8) 30 minutes or so after, the final set of falls with a wading pool in front. The stream becomes flat, narrow and relatively uninteresting afterwards. Use the various footpaths on either sides. (9) Eventually, a bridge on the Pat Sin Leng Nature Trail (八仙嶺自然教育徑) will be in sight., about 20-25 minutes after the last set of falls. You can't miss it. That's the end of the stream for you. (9) Head right on the bridge. The path parallels the stream for a short while. It will take you about 20 minutes to get back to the bus stop. You'll eventually get to the direction stones, follow on the right towards Bride's Pool. If it is early enough, go check-out the Bride's Pool's falls. Afterwards, bus 275R will bring you back to Tai Po.